ABC has announced yesterday that the used to be a hit comedy series Ugly Betty has been cancelled. Ugly Betty is on it's fourth season and was shockingly moved to a Friday timeslot last year due to low ratings. This year though it was moved to a Wednesday timeslot because of the cancellation of Eastwick. Ugly Betty has eight more remaining episodes and will conclude this April. The creators and writers of Ugly Betty are now working with the story on how to end the series. It is a bitter sweet end for Ugly Betty. I must admit that i am one of the avid fans of the show. It is about time to end the series since the story has been off lately. 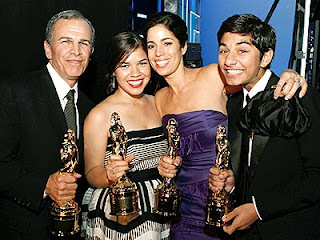 It's just sad that we won't see our loved ugly Betty cast anymore. They are like family to the fans and it would be different without them. Anyway, what are in store for the cast of Ugly Betty? A spin off maybe?